Ginger Jackson Sinton is a graphic designer who writes and designs corporate communications and feature articles from her office in Atlanta. 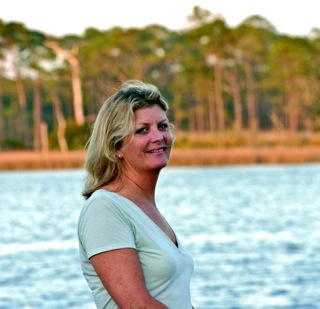 Her words and images have appeared in publications such as Lake Oconee Living, The Thirty A Review, The Wine Report, and VIE Magazine, among others. She recently received her Master of Arts in Professional Writing from Kennesaw State University. A native Georgian, she considers South Walton her second home. 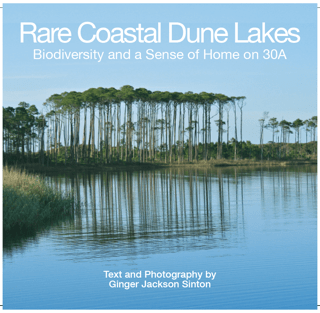 In her new book, “Rare Coastal Dune Lakes: Biodiversity and a Sense of Home”, author/photographer Ginger Jackson Sinton explores the beauty of the lakes and the diversity of their ecosystems. Rare Coastal Dune Lakes are fifteen, dynamic, geological treasures – freshwater with occasional saltwater exchange from the gulf – in Walton County, Florida. Ginger’s recent publication, a full-color, 112-page, softbound photobook, reveals the beauty and rarity of the lakes and surrounding communities along the Scenic Highway 30A area. With an eye for nature, she weaves personal anecdotes throughout the photo guidebook. A “Sense of Home” in the subtitle is twofold: habitats of native plants and animals and her own fondness for the colorful locale along the Gulf Coast.